Camping is fun for me; I love to cook over an open fire or on the camp stove. Summer is a great time for fresh produce. If you can combine cooking and being in nature that is the best deal for me! Now this is car camping, you know… where you drive there with a trunk full of sleeping bags, tent, tarps, comfy clothes, cook stove, lanterns, and coolers of food… So I had lots food and I also brought my cast iron waffle maker; an antique from the 1920s that was my sister Margie’s and before that my parents. It was kinda messed up when she gave it to me but Joe and I worked hard to bake off the crud and now it works fantastically… and corn on the cob, shrimp and swordfish (frozen), half frozen chicken thighs, lamb loin chops and a zillion other food items. Nothing like traveling light! So we enjoyed some good food. For breakfast I made waffles, then pancakes, and then more waffles the third morning. The pancakes are lovely; for a year or two I just couldn’t find any pancakes that measured up to what I felt they should taste like. These are from Elizabeth Hasselbeck’s cookbook. Sometimes I add extra milk if they are too thick. I pour the batter right out of a mixing bowl with a pour spout onto the griddle. And, again, I forgot to take pix of the waffle iron in action; have one shot of a waffle quarter from last summer; before I snarfed it down so here is that recipe (my version; based on a pancake recipe in Gluten-Free Baking Classics by Annalise Roberts. This recipe is great for camping because buttermilk travels better than regular milk and it also uses oil not butter in the waffle; easier to deal with than melting butter on the camp stove…. The other week I was out of buttermilk and used kefir, a fermented milk; worked fantastically. While you are doing that mixing step the waffle iron should be heating. 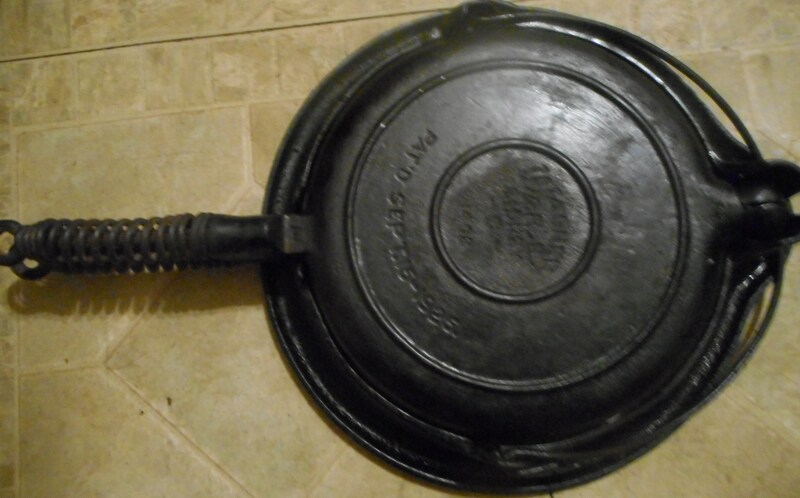 I use a round cast iron waffle iron; please do spray it with cooking spray before heating and then I melt about 1-2 tsp. of butter into the 4 quarters; I blop the chunk around with a fork so some melts into each part of the iron. Flip the iron over just before putting in the batter. I use a big spoon to glop it into the waffle iron. One big glop in each half. Close the iron and let it bake about 2 minutes. Flip it and bake 1-2 more minutes, or however long your waffle iron takes. I serve it with real maple syrup; something this good deserves the best. Before I serve the first waffle I break off a section and eat it hot and plain; you can really taste the cinnamon that way. Make sure your waffles are crisp not soft. The crisp is Everything! We had scrambled eggs and breakfast maple flavored sausage links; both go fantastically well with waffles. Originally posted in July 2015 and again in 2016 with minor text revisions. Recipe the same. I know it is the Fourth of July weekend and everyone is eating potato salad and burgers and guzzling booze. Got that in my plans but this healthy and simple lunch is just the ticket to balance against all those less than healthy meals I plan on consuming. Bonus: it is naturally gluten free and tasty. Beet greens are underutilized; most people buy beets in a can or if fresh, the beet tops are cut off. But, if you grow your own maybe you have tried them. They are full of vitamins and minerals and are crazy healthy (lots of protein, fiber, iron, folate, magnesium and calcium!) – some consider beet greens to be in the top ten of healthy greens: http://www.whfoods.com/genpage.php?tname=foodspice&dbid=151. 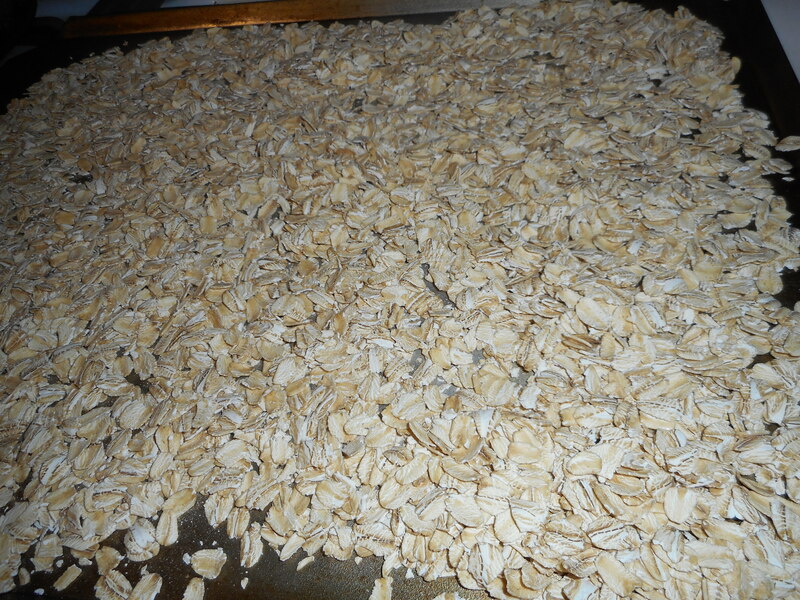 I steam them a few minutes; depends on how much I put in the pan; maybe 5 minutes. As shown above I love them with butter, salt and pepper: tasty with a subtle beet flavor. And I still have the beets for use in another meal. I do love raw beets in a salad; I suggest you try that sometime! I have a new recipe for that; trying this weekend. To butter poach eggs melt a tbsp. butter in an egg frying pan at medium heat. This is the Teflon pan I use only for making eggs. They don’t stick when you don’t share the pan with other cooking. I slide in each egg. Then I add 1-2 tbsp. water and sprinkle the eggs with green Tabasco sauce. It is far milder than the red and I love the way it goes with fried eggs. Cover the pan with a lid and steam on low for 2 minutes. Turn off heat and if you are like me; I want my eggs barely runny; so I let them stand a minute. If you want runny take them out after the two minutes. Butter poaching with a tablespoon or so of water gives you a soft egg, no hard edges and the flavor almost of a poached egg but shaped like a fried egg. Bonus is you have total control because you can see the yolk, even touch it to test for doneness and you can flavor it as soon as the eggs go in the pan or as the eggs cook. My green hot sauce is my go to topper but there are a host of sauce choices out there like sriracha sauce, Tabasco hot sauce, gf soy sauce, etc. For this posting I tried my eggs with a big sprinkle of fresh feta cheese or minus the feta cheese. I loved them either way. Feta cheese lovers rejoice! One of these eggs is a farm egg and one is from the grocery store. Love farm eggs! Sprinkle with good quality salt and freshly ground pepper and you have an inexpensive, tasty and healthy protein. Eggs were out of favor for a long while but I never gave up on them. My dad always said they were good for you and that the lecithin in them counteracted the rich yolks. Now experts say they are okay to eat within moderation. Go figure! Regardless, I do love them for a quick satisfying meal at a low cost and they match perfectly with the earthy flavor of beet greens. Don’t forget a touch of butter and the salt/pepper; this dish really needs it to brighten the greens. Enjoy! Camping is a lot of fun for me; I love to cook over an open fire or on the camp stove. Summer is a great time for fresh produce. If you can combine cooking and being in nature that is the best vacation for me! Now this was car camping, you know…where you drive there with a trunk full of sleeping bags, a big tent, comfy clothes, cook stove, lanterns, tarps and lots of food… So I had a big plastic tub crammed full of food that didn’t need chilling, my huge cooler, Joe’s little cooler which was full of ground coffee, half and half, earthworms and other fishing lures! 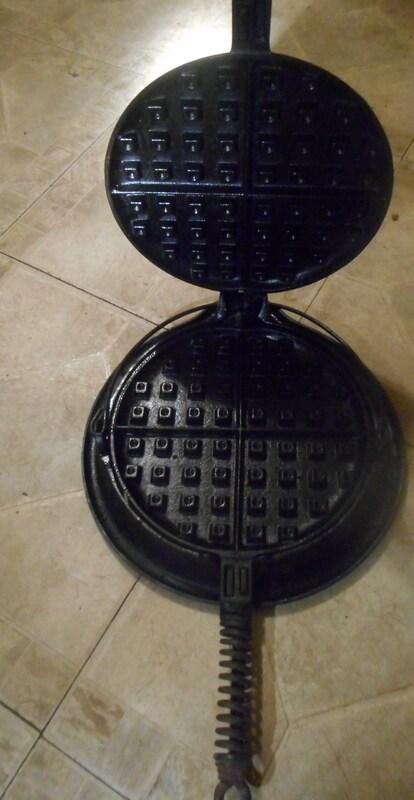 I also brought my cast iron waffle maker; an antique from the 1920’s that was my sister Margie’s and before that my parents. It was kinda messed up but Joe and I worked hard to bake off the crud and now it works fantastically… and a bag of marshmallows, corn on the cob, frozen chicken thighs and a zillion other food items. Nothing like traveling light! So we enjoyed some good food. For breakfast I made blueberry pancakes one morning and then my cinnamon waffles the next. The pancakes are my new love; until recently I just couldn’t find any pancakes that measured up to what I felt they should taste like. These were from Elizabeth Hasselbeck’s cookbook. Sometimes I add extra milk if they are too thick. I pour the batter off a big serving spoon onto the griddle. I forgot to take any pictures. Boo hoo. But I did take one shot of a waffle quarter before I snarfed it down so here is that recipe (my version; based on a pancake recipe in Gluten-Free Baking Classics by Annalise Roberts. This recipe is great for camping because buttermilk travels better than regular milk and it also uses oil not butter in the waffle; easier to deal with than melting butter on the camp stove…. Directions: To make it portable; measure the dry ingredients into a zip-lock baggie. I like to write the other ingredients on with a black Sharpie marker. Beat the egg in a large mixing bowl, add the oil, buttermilk and vanilla (optional in my book when camping). 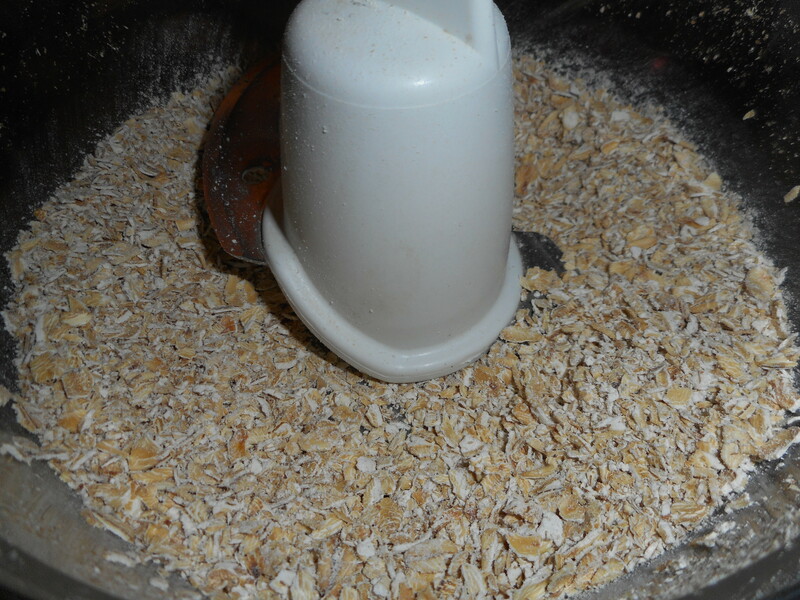 Pour the dry mix into the bowl and whisk briefly until fairly well mixed. While you are doing that mixing step the waffle iron should be heating. I have a fantastic round cast iron waffle iron; please do spray it with cooking spray before heating and then I melt about 1-2 tsp. of butter into the 4 quarters; I blop the chunk around with a fork so some melts into each part of the iron. Flip the iron over just before putting in the batter. I use a big spoon to glop it into the waffle iron. One big glop in each half (roughly 2/3 cup batter) but I never measure. Gently close the iron and let it bake about 2 minutes. Flip it and bake 1-2 more minutes, or however long your waffle iron takes. I peek and lift it with a fork to check for crispness. I serve it with real maple syrup; something this good deserves the best. Before I serve the first waffle I always break off a section and eat it hot and plain; you can really taste the cinnamon that way. Yumm! Make sure your waffles are crisp not soft or pale. Everyone really wants a crisp well tanned waffle; be patient and wait for it! 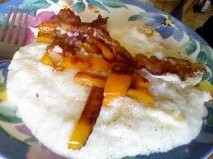 We had fried eggs with it. 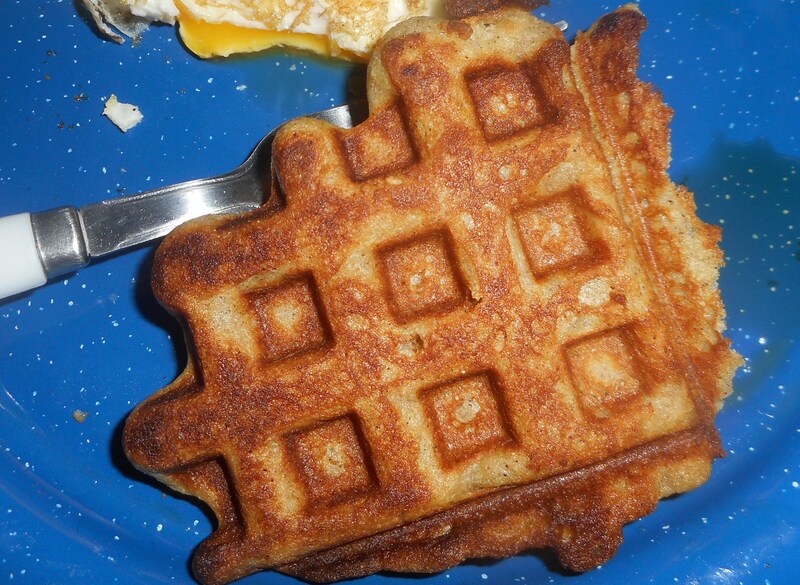 Bacon or breakfast sausage goes fantastically with waffles. Blueberry Pancakes, GF AND Yet Fat and Sassy! Who know it would be so difficult to find a really tasty gf pancake recipe? Tried a few and found some too dry and some too bland. It took me just about 2.5 years to find ones I really liked. Fat, tender and flavorful. I don’t miss my old wheat based pancakes anymore. Plus these are super easy to make; dump and stir. Sorry, no ready made box mix used here but I am considering making a dry mix version of this recipe so I can blend them together in a hurry. 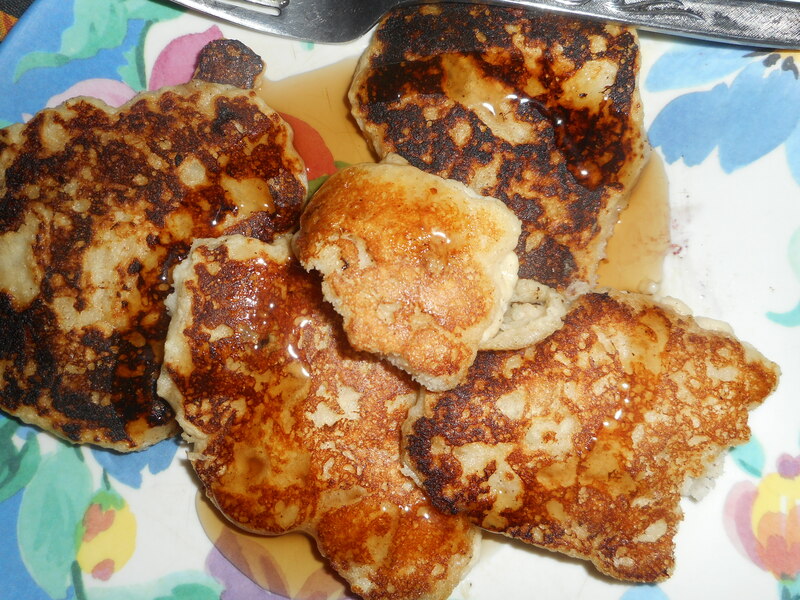 Soon, when I can find the time to figure out the way to do it best, then I will be ready to make almost instant pancakes from scratch!They are from Elizabeth Hasselbeck’s cookbook. I am generally not a fan of celebrity cookbooks but this recipe is worth sharing. So try these and you will find them to be fat and utterly yummy. 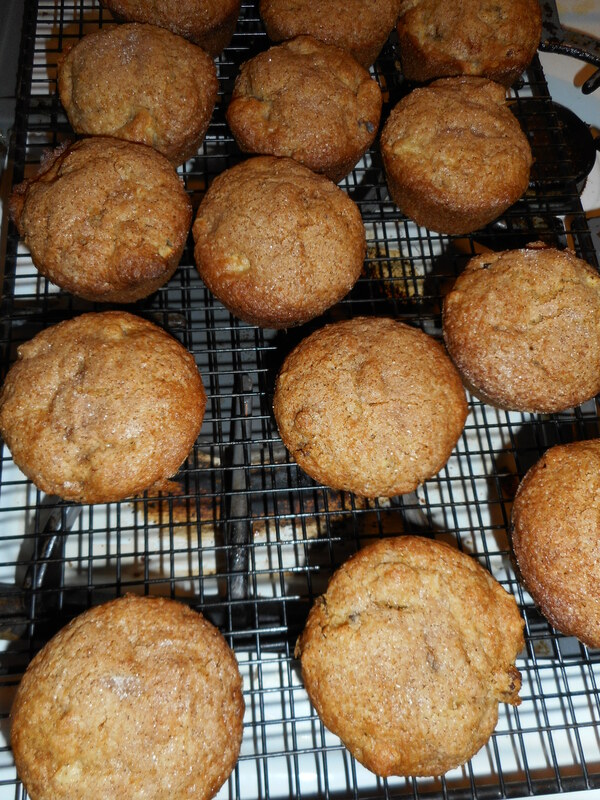 I put blueberries in mine but they are good plain and would taste fantastic with chocolate chips added on top! My three year old grandson loved them the other week. We sprinkled a little cinnamon in our batter too. I think someone already took a bite out of one of these beauties! Directions: Whisk the dry ingredients in a large bowl. 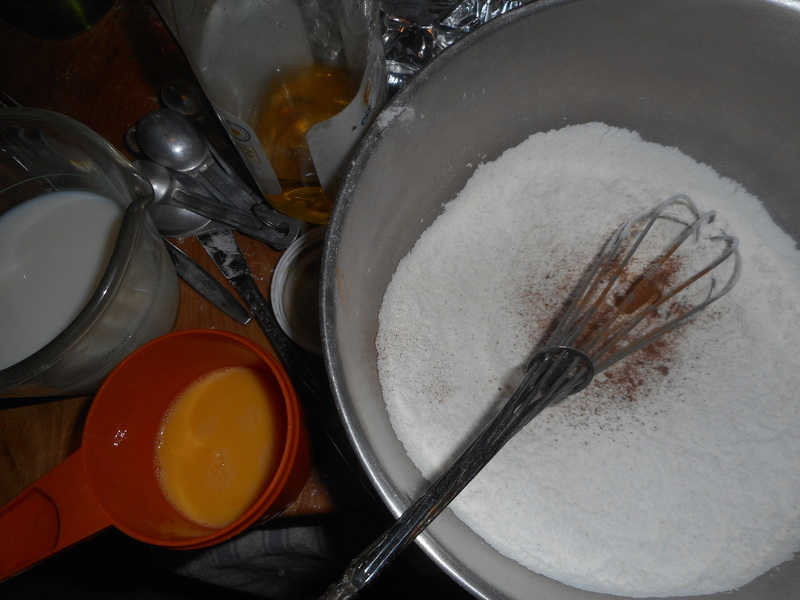 Mix the next three ingredients in a small bowl, whisk well, mix in the melted butter, whisk. Pour into the dry ingredients, mix with whisk just until no dry shows. If the batter looks too thick add 1-2 more tablespoons milk and stir up. I heat the griddle while I do the mixing so it is all ready when the batter is mixed; it doesn’t keep well; to get the fattest puffiest pancakes the secret is mix briefly and you have to bake them right away. Heat griddle until hot, add some butter, I like to use a big kitchen spoon to measure and I do 3 or 4 pancakes on my cast iron griddle at a time. Sprinkle 3-5 berries on top of each pancake and add a sprinkle of cinnamon. Let them cook until the edges look set; about 2-3 minutes. Turn with flat spatula turner. Let cook 1-2 more minutes. Do not flip again. 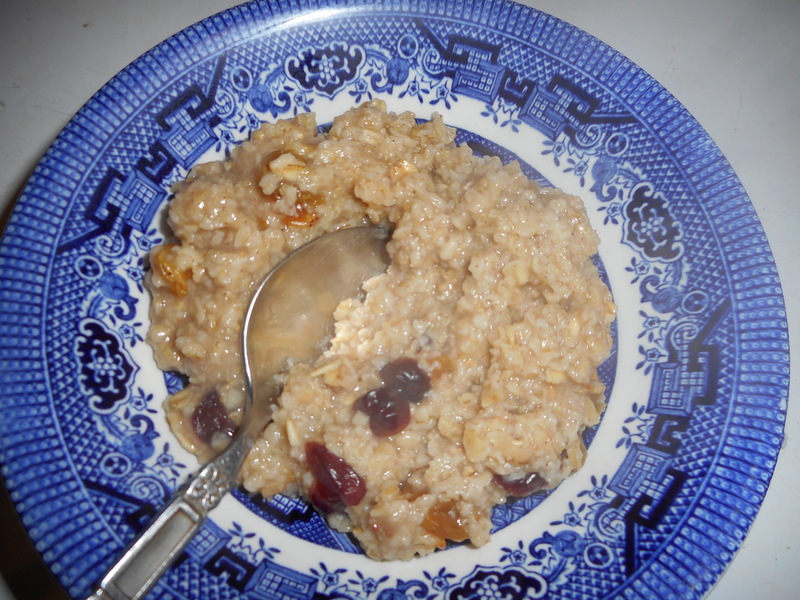 Serve with maple or blueberry syrup.